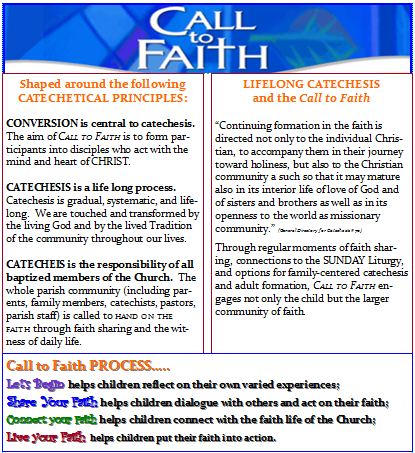 CHILDREN OF ALL AGES gather with persons of every age and every generation for WHOLE PARISH FAITH FORMATION on the FIRST Sunday of each month. What source of CATHOLIC wisdom and experience does CALL TO FAITH draw on? Children’s Liturgy of the Word is celebrated on the Second and Fourth Sunday of the month at the 10 am Mass. After the opening prayer children ages 3-11 are invited to come forward to receive the Light of Christ and the Book of God’s Word. Trained adult worshipr leaders and children process to the Blessed Sacrament Chapel to celebrate the Liturgy of the Word using the children’s lectionary. The readings, psalm, homily, and prayers are simplified to enable children to understand and respond to God’s Word. Children return to the assembly with the Preparation of the Gifts to celebrate the Liturgy of the Eucharist. IN ADDITION, special gatherings occur as announced, to celebrate the Saints, Feast Days and Holy Days. VACATION BIBLE SCHOOL OCCURS EVERY SUMMER!